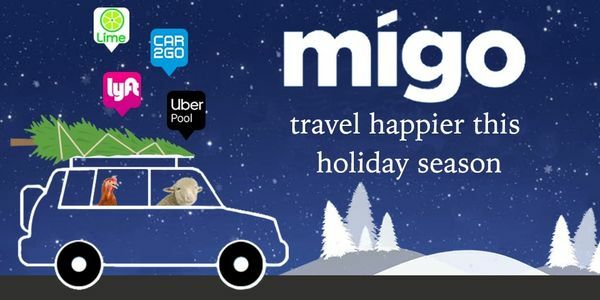 Ride Share, Carshare, Taxis, Bikes, We’ve Got You Covered in Charlotte with Migo! There are 49 ways to get around Charlotte, North Carolina, and 34 of the best ways are available through an app! Choose between 3 carshare, 14 taxi, 11 rideshare, bikeshare, or 19 black car/limo companies. The best 5 ways to get from A to B in Charlotte are on Migo. Whether you need the closest, cheapest, or fastest ride, Migo has all of them in one app. Scroll down to see all the different transportation apps available on iTunes or GooglePlay. Choose from one of the providers below to help you get around Charlotte today. After sampling some craft beers, head to Seoul Food Meat Company for some Korean-style chicken and other fun side dishes! Head to Fahrenheit, a rooftop bar for fun cocktails and unbeatable views of the Charlotte city skyline. If you need a break from you long day of art seeing, head to The Dog Bar, a friendly bar with a play area for pups of all size! If you've got some late night munchies, head to Diamond Restaurant, a late night diner-style eatery with a jukebox for entertainment! Head over to the NASCAR Hall of Fame every second Saturday for an interactive, educational exhibit to learn about the fine details of high-speed racing. The park is unfortunately closed until the end of March, but you can plan your trip and purchase tickets ahead of time to avoid lines when you get there! Treat yourself, and grab a cocktail and enjoy some live jazz on the first Friday of every month! Take note of the sculpture of Queen Charlotte between the airport's two parking decks. She is how the city got its nickname "Queen City"! Read about what's new at Migo in Charlotte.